Nearly all functions in Phaedra require that you have plates imported first. This topic explains how to import plates, using the Import Wizard. The plate data is in an accessible location. In this tutorial, plates will be imported from a Columbus server. An appropriate protocol has been set up. For more information on setting up protocols, see Creating a new protocol. Depending on the size of the data, importing may take a while and consume a large amount of computer resources. As described in the previous paragraph, this tutorial assumes that plates will be imported from a Columbus server. Before we can do that, we must first configure Phaedra to know where the server is located, and how it can be accessed. 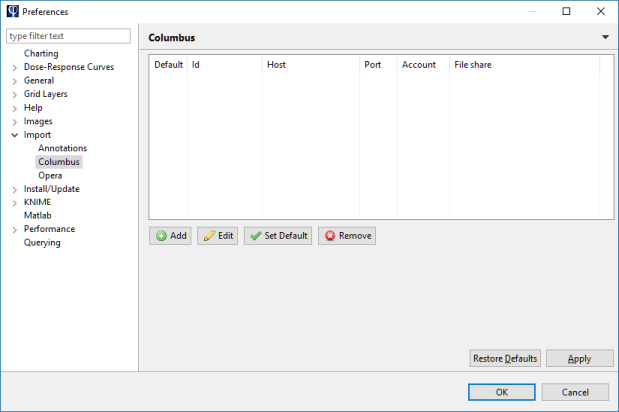 To configure a Columbus server in Phaedra, open the Window menu and select Preferences. 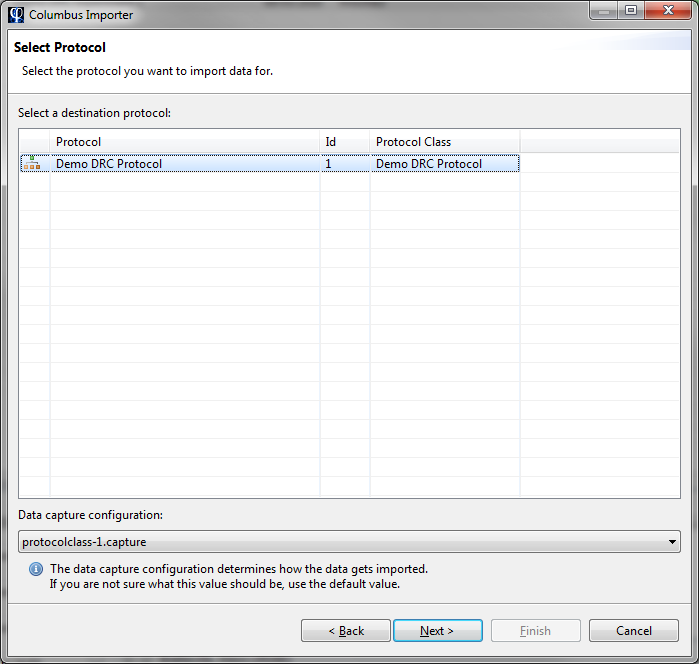 In the Preferences dialog, navigate to Import > Columbus. To register the Columbus server, select Add. Port: the port number of the Columbus server. By default, this is 8081. Note: in the default Columbus datacapture script that comes with Phaedra, the 'file share' setting is ignored. 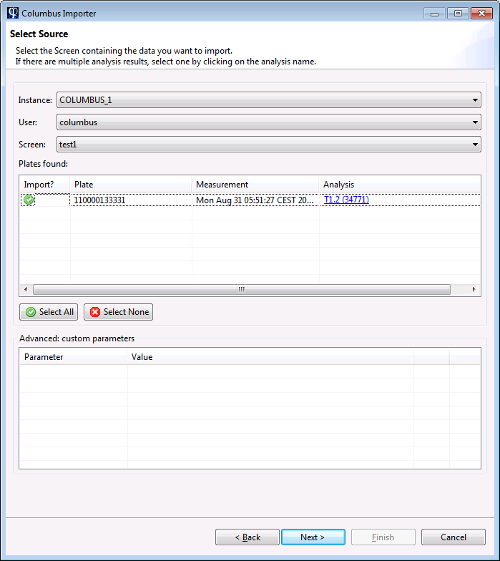 This setting is only used in custom datacapture scripts, to import additional data that is not stored in Columbus, such as segmentation label images and single-cell data. Click on the Import Wizard button in the toolbar. In this tutorial, plates will be imported from a Columbus instance. 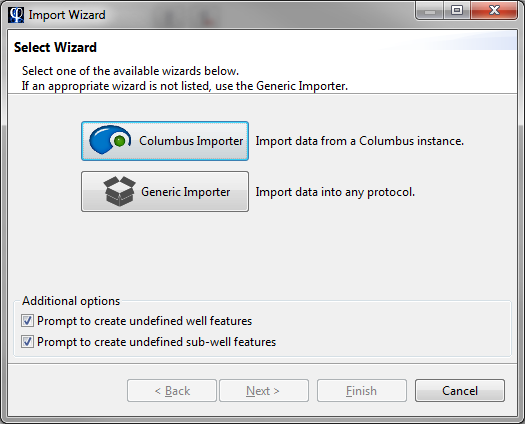 In the Import Wizard, select the Columbus Importer. First, select the protocol where you want to import plates to. 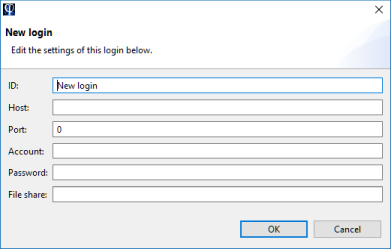 Note: When you select a protocol, an appropriate Data capture configuration will be selected automatically. Under normal circumstances, it is not necessary to change this selection. In the next screen, a list of Columbus users and screens is presented. Select the user who owns the plates in Columbus, then select the screen containing the plates. In the table below, all valid plates will be listed. A valid plate is a plate with at least one measurement and analysis result set. To exclude a plate from the import, click on the green check icon, changing it into a red stop icon. The plates will be inserted in a new or an existing experiment. You can select this in the next screen. 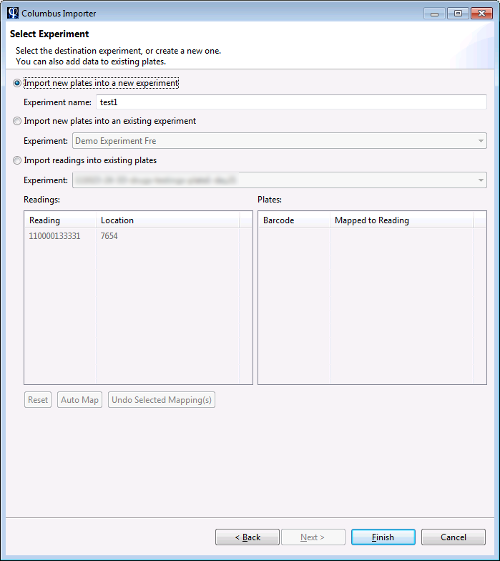 If you select an existing experiment, the plates will be added to it. Plates will never be overwritten during an import. Select Finish to start the import. Depending on the size and number of plates, this may take a while. You can do other work in the meantime by clicking on Run in Background.